ShengYa products are distributed by Grant Fidelity, located in Alberta, Canada. They span a variety of models and manufacturers, but their focus is high-value audio products. I met the proprietor, Ian Grant, at the 2009 RMAF. He was quite the knowledgeable audiophile, and had a roomful of great products. The CS-6 and PSM-600s that I had in my home system for three months were there, stacked godzilla-like in the manner shown in the lead picture to this article. I won’t dwell on it, particularly since some might say that my aesthetic judgment is questionable, but aside from looking big and powerful, the CS-6/PSM-600 appearance is quite attractive. All three pieces have a consistent design theme that employs four cylindrical silver/chrome stands that act as feet and run to the top of each unit. The four stands support an all-black body with silver buttons and silver/black dials on the preamp and silver buttons and a big backlit bias meter on the monoblocks. The CS-6 (MSRP $4,900) is a tubed preamp with a completely dual-channel design down to separate transformers. Four Russian gold-pin 6922 vacuum tubes on gold coated sockets are used for each channel. The preamp has six pairs of inputs (one balanced) and four pairs of outputs (two balanced). 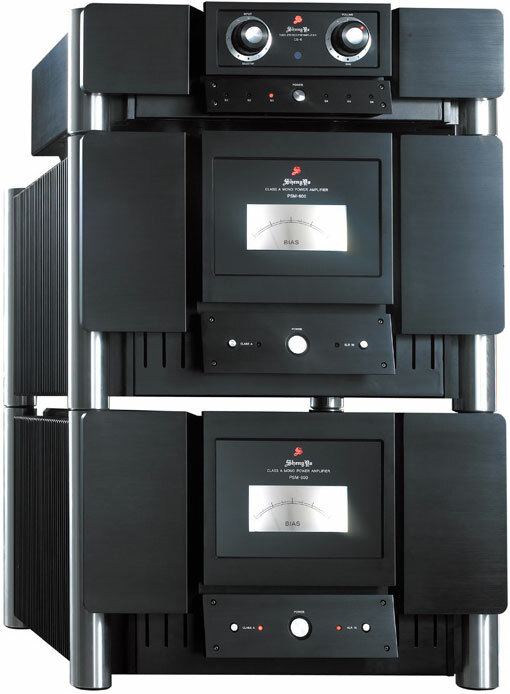 As mentioned above, its looks matches the looks of the PSM-600 monoblocks, and it is designed, should the user so choose, to be stackable on top of the monoblocks (as illustrated in the picture above). The Grant Fidelity website notes that the CS-6 can easily match with just about any power amplifier on the market. Among the features of the CS-6 is the ability to adjust the gain setting to better match the amp it is paired with. I’ve had significant problems in matching solid-state amps with tubed preamps in the past and wanted to see how the CS-6 would do in head-to-head comparisons with other similarly priced tubed preamps. I didn’t have any tube preamp review samples available, so I ended up borrowing two tube preamps from some buddies. One preamp was in the $3,000 retail range, while the other was in the $4,500 range. One was run with both the PSM-600s and my Electrocompaniet Nemo monoblocks, the other was run with the PSM-600s and two Plinius SA Reference stereo amplifiers (configured as monoblocks). The relative gain on the other tube preamps did not match well with any of the high-powered amps, even very low volume settings produced loud volumes. On the other hand, the CS-6 did not have this problem, even without using its gain-adjustment feature. Admittedly this was not intended to be a very scientific test, but the point is that the CS-6 mated very well with several other manufacturers’ high-power amps. Another thing that jumped out early about the CS-6 was its very quiet performance. My prior tube preamps had always generated more noise than my solid-state preamps. In fact, both of the two borrowed tube preamps I mentioned above exhibited this characteristic, but the CS-6 was quieter considerably. Even in direct head-to-head comparisons with my MBL 6010D and the Pass Labs XP-20, both of which are among the quietest preamps I’ve ever encountered, there was little difference in the background noise generated by the tubed CS-6. Turning to sonic attributes, the CS-6 also performed significantly better than the two tube preamps in the both the soundstaging and neutrality departments. The CS-6’s obvious superiority to the other two preamps persuaded me that I should compare the CS-6 to the more expensive Pass Labs XP-20 and MBL 6010D, despite the large disparity in price ($8,600 for the Pass and $24,000 for the MBL). These comparisons revealed the CS-6 to be a great value, especially when matched with its companion, the PSM-600’s. I first compared the CS-6 to the Pass Labs XP-20, which I reviewed in the July 2009 edition of Dagogo. The CS-6 did not have the Pass Labs XP-20’s width of soundstage, but its depth was just as good, if not better, producing a holographic image of the performers. It was both fuller and looser on bass reproduction, but not in an incorrect or unpleasing way – it was merely being more tube-like, which is exactly what you would want and expect from a tube preamp. Its strength, of course, was the roundness, fullness and decay of the musical notes. Top notch solid-state and tube products have steadily addressed their respective weaknesses with advances in design, but if you’re experienced you can generally still hear the difference between the two designs by simple listening. The CS-6 did not have the $24,000 MBL 6010D’s phenomenal dynamics, but it sure reproduced dynamic material very well. Orchestral pieces especially had a proper dynamic contrast that was impactful and very pleasing. It also had excellent body, and comparisons to the MBL (which in my experience is the most full-bodied solid-state pream around) confirmed this. These characteristics were replicated in every listening session with every type of musical genre. Standing on its own, the CS-6 was obviously a tremendous value. Its performance clearly exceeded that of similarly-price tube preamps, and it provided 85% of the performance my cost-no-object MBL 6010D. This value was only enhanced when the CS-6 was paired with the ShengYa PSM 600 monoblocks, which I am discussing in the following. The PSM-600 monoblocks (MSRP $19,000) are constructed with 48 high performance transistors, 3000-watt shielded transformers, 240,000 uF filter capacitors and huge aluminum heat sink for each channel. At 176 pounds each they are definitely the heaviest amps I’ve ever had the pleasure of wrestling onto my amp stands (I skipped my regular workout that day). I was able to compare the PSM-600’s directly to some of my absolute favorite amps, as well as simultaneously getting a great workout. Moving big monoblocks around can be backbreaking work, and I had three different ones available at the same time: the PSM-600, the Plinius SA Reference (a pair, configured as monoblocks) and my Electrocompaniet Nemo. Readers who have read my other reviews know that I personally favor a full-bodied sound on the music I listen to, which is primarily rock, blues and jazz, in that order. My personal equipment choices reflect that preference. I have several audiophile buddies who listen almost exclusively to classical music, and they have systems that are very different from mine. Their systems emphasize delicacy and nuance. As a result of this wide difference in musical preferences, I have developed a review sequence that starts with classical music, shifts to jazz, and ends with blues and rock. I find that this sequence gives me the best handle on how the equipment I’m reviewing will be perceived by a wide variety of listeners. Thus, the first disc I played after I had broken in the PSM-600s was the really excellent XRCD disc of Vivaldi”s Four Seasons. I first played it in regular AB mode and was instantly impressed with its delicacy – a very nuanced and delicate presentation that most associate with much lower powered amps. I then engaged Class A and replayed the piece. Oh my gosh! What do we have here?! Even more nuance and delicacy, but with three-dimensional holographic images and realistic body. I recently reviewed the tremendous Plinius SA Reference, and raved about the flexibility available to the listener when you have the ability to switch between Class AB and Class A mode on the fly. The PSM-600’s seemed every bit as good in this regard, and perhaps even a tad better when in Class A mode. This experience was repeated on several other classical discs. In each case the PSM-600’s run in Class A mode achieved a delicacy of presentation that was unmatched by other high-power amps I’ve auditioned or reviewed. On dynamic passages this delicacy was complemented by the type of musical impact that can only be delivered by high power monoblocks. I moved on to the Bennie Wallace XRCD The Old Songs. Wallace’s saxophone sounded absolutely pure and live, both on energetic and melancholy passages. Percussion had great snap and sizzle when the band was cookin’, while simultaneously reproducing the nuanced shimmer of real cymbals in my room when that was called for. When it was time to check out how rock sounded, I decided to go “classic” and teed up “Satisfaction” from the Rolling Stones Hot Rocks SACD. Before I pressed “Play” I momentarily fretted about whether Keith Richards’ famous opening riff would have the requisite bite. Not to worry – lead guitar bite and bass authority came in spades. Moreover, the all-important midrange sounded very natural, with Mick Jagger’s unmistakable voice coming across the way I’ve heard in some of the best systems available. By way of direct comparison to the two other world-class high-power amps available to me at the time, the Plinius SA References produced the most impressive bass I’ve ever heard, the Electrocompaniet Nemos had a bit more fullness and body at the expense of some bass articulation, while the PSM-600s were best able to reproduce delicacy while providing powerful bass with great articulation and extension, but with slightly less weight than the Nemos or References. You had to be there to tell. One really nice touch about the ShengYa that I should mention is that the preamp and amps come with what looked and sounded like upgraded XLR interconnects and power cables. I’ve never encountered this before. Every other amp I’ve purchased or reviewed came with “standard” cheap power cords and nothing else. These came with cords that were one step up in quality – a nice touch. The fact that XLR interconnects were also provided was an even nicer touch. In effect, the boxes came with everything you need and then some to immediately connect and play music through your CS-6/PSM-600 combo. Grant Fidelity’s website states that: “This combination is designed to drive any speaker load and is a perfect match for B&W 801’s”. They’re definitely not exaggerating. I have 800D’s, but I can readily attest that the CS-6 and PSM-600 combo would likely be perfect for speakers like the 801’s, which need to simultaneously have their 15” bass drivers controlled while allowing the diamond tweeters and midrange to reproduce delicate and airy music. The ShengYa combo was very good with my 800D’s, with a bass control that was tight and defined. I was able to get great speed and weight with both Aural Symphonics Hybrid v3 speaker cables and Silent Source Silver Signatures. I preferred the PSM-600’s with the Aural Symphonics on my 800D’s, but I guess that I might prefer the Silent Source with 801’s. The main point is that the CS-6/PSM-600 combo is a hell of a match with the B&W 800D and 801. The pairing of the CS-6 with the PSM-600s is excellent. Especially when run in class A mode, the combination was not only powerful and dynamic, but it was also capable of an astonishing delicacy coupled with excellent body. I personally preferred the PSM-600’s when they were matched with my MBL 6010D preamp, but comparing a $4,900 preamp to a $24,000 preamp is nonsensical. The CS-6 was an excellent value as a stand-alone preamp, but has a great synergy with the PSM-600’s by adding tube warmth to the PSM-600’s ability to reproduce delicate treble and midrange passages while cranking out dynamic power for drums, acoustic double bass and organs. The ShengYa CS-6/PSM-600 combination clearly sits at or near the top of the Grant Fidelity lineup, both in quality and cost. If you are looking for high-value high-end you cannot go wrong with this combo, which sells at a price that in my experience is at least $6,000 less, and in some cases up to $20,000 less, than the price you’d pay for comparable super audiophile-quality amplification. Of the two components, the PSM-600 is among the best you can get at any price, while the CS-6 is a very good preamp which is also among the best values you’ll ever find. Strongly recommended without any reservations.